By accessing or using this website you agree to be bound by these terms and conditions. All website design, text, graphics, interfaces, and the selection and arrangements thereof are © RENOVATING Publications ALL RIGHTS RESERVED. 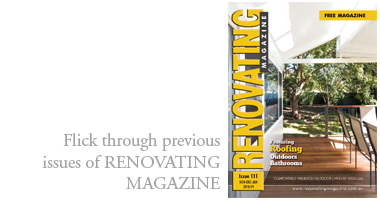 Permission is granted to electronically copy and to print hard copy portions of this website for the sole purpose of placing an order with RENOVATING Publications or using this website as a shopping resource. Any other use of materials on this website, including reproduction for purposes other than those noted above, modification, distribution, or republication, without prior written permission of RENOVATING Publications is strictly prohibited. All trademarks and trade names (collectively the “Marks”) are proprietary to RENOVATING Publications or other respective owners that have granted RENOVATING Publications the right and licence to use such Marks. RENOVATING Publications makes reasonable efforts to ensure that all content provided on this website is accurate and up-to-date. However, RENOVATING Publications does not represent or warrant that all the content is accurate, current or complete. TO THE MAXIMUM EXTENT PERMITTED BY LAW, THE INFORMATION, SERVICES, PRODUCTS, AND MATERIALS CONTAINED IN THIS WEBSITE, INCLUDING, WITHOUT LIMITATION, TEXT, GRAPHICS, AND LINKS, ARE PROVIDED ON AN “AS IS” BASIS WITH NO WARRANTY. TO THE MAXIMUM EXTENT PERMITTED BY THE LAW, RENOVATING PUBLICATIONS DISCLAIMS ALL REPRESENTATIONS AND WARRANTIES, EXPRESS OR IMPLIED, WITH RESPECT TO SUCH INFORMATION, SERVICES, PRODUCTS, AND MATERIALS, INCLUDING BUT NOT LIMITED TO WARRANTIES OF MERCHANTABILITY, FITNESS FOR A PARTICULAR PURPOSE AND NON INFRINGEMENT. TO THE MAXIMUM EXTENT PERMITTED BY LAW, RENOVATING Publications EXCLUDES LIABILITY FOR ANY DIRECT, INDIRECT, SPECIAL, PUNITIVE, INCIDENTAL, EXEMPLARY OR CONSEQUENTIAL, DAMAGES, OR ANY DAMAGES WHATSOEVER, EVEN IF RENOVATING Publications HAS BEEN PREVIOUSLY ADVISED OF THE POSSIBILITY OF SUCH DAMAGES, WHETHER IN AN ACTION UNDER CONTRACT, NEGLIGENCE, OR ANY OTHER THEORY, ARISING OUT OF OR IN CONNECTION WITH THE USE, INABILITY TO USE, OR PERFORMANCE OF THE INFORMATION, SERVICES, PRODUCTS, AND MATERIALS AVAILABLE FROM THIS WEBSITE. This website may contain links to other websites on the Internet that are owned and operated by third party vendors and other third parties (Third Party Sites). RENOVATING Publications is not responsible for the quality, content, nature or reliability of any Third Party Sites. You acknowledge that linking to Third Party Sites is at your own risk. The laws of the state of New South Wales, Australia govern the operation of this website and the interpretation of these terms and conditions. You agree to submit to the jurisdiction of the Courts of New South Wales in the event of any claim or dispute arising between you and RENOVATING Publications.